I AM PLANNING A COUPLE DIFFERENT LITTERS FOR THE SUMMER AND FALL 2018 FOR STANDARD BERNEDOODLE PUPPIES, MINATURE BERNEDOODLE PUPPIES AND POSSIBLY SOME MINATURE BERNEDOODLE PUPPIES WITH BLUE EYES!!! THE PARENTS OF THESE LITTERS HAVE HAD THEIR GENETIC HEALTH TESTING COMPLETED VIA VETNOSTIC LABS AND DAD HAS HAD HIS OFA DONE WHICH WAS GOOD AND CLEAR. 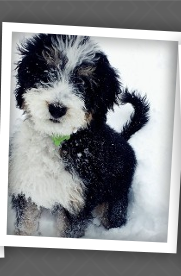 THE STANDARD BERNEDOODLE PUPPIES WILL BE AROUND 70 TO 95 LBS AS ADULTS AND THEY WILL ALL BE TRI COLORED WITH LOTS OF WHITE AND RUST MARKING ON THEM. THE MINATURE BERNEDOODLE PUPPIES SHOULD BE AROUND 45 TO 65 LBS, I AM EXPECTING DIFFERENT COLORS OF BROWN/TAN AND WHITE, BROWN MERLE AND TRADITIONAL TRI COLORS WITH LOTS OF WHITE AND RUST ON THEM. 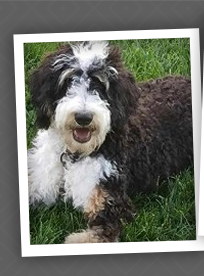 HERE IS SOME ADDITIONAL INFORMATION ABOUT ME, MY BERNEDOODLES AND MY BREEDING HISTORY. I HAVE BEEN BREEDING DOODLES FOR OVER 14 YEARS ALONG WITH MY STANDARD POODLES. AFTER MUCH RESEARCH I DECIDED TO ADD THE BERNESE MOUNTAIN DOG (BMD) TO OUR BREEDING PROGRAM AND BREED BERNEDOODLES. I HAVE ALWAYS LOVED THE BERNESE MOUNTAIN DOG BUT WAS CONCERNED ABOUT OWNING ONE DUE TO THEIR SHORT LIFE SPAN. AFTER MUCH DEBATE, I DECIDED THAT THE BERNESE MOUNTAIN DOG IS THE PERFECT DOG TO BREED TO THE STANDARD POODLE TO PRODUCE BERNEDOODLE PUPPIES WITH AN INCREASED LIFE SPAN AND DECREASED RISK OF HEALTH CONCERNS. I HAVE SINCE ADDED A FEW MORE AKC BMD FEMALES TO OUR BREEDING PROGRAM, SASHA, CYBELE, DREAM AND ANNIE. THEY ARE QUALITY BMD'S AND COME FROM HEALTHY BLOODLINES WITH GOOD HEALTH TESTINGS IN THEIR BACKGROUNDS. CYBELE HAS ONE BLUE EYE, WHICH I HOPE WILL BE SHARED BY HER PUPPIES IN THE FUTURE. CYBELE IS A VERY BIG GIRL AND IS AROUND 110 LBS. SHE IS VERY AFFECTIONATE AND LOVES ATTENTION. SHE THINKS SHE IS STILL A LAP DOG. SASHA HAS MULTIPLE CHAMPIONS IN HER PEDIGREE ALONG WITH INTERNATIONAL BLOODLINES FROM HUNGARY. SASHA IS AROUND 85 LBS. SHE IS GENTLE, PLAYFUL AND LOVES THE WATER. THE OTHER TWO GIRLS ARE YOUNGER AND STILL NOT OF AGE TO MOVE INTO OUR BREEDING PROGRAM. OUR STUD IS "WALTER", AND HE IS AN AKC STANDARD POODLE THAT HAS A VERY UNIQUE COLOR PEDIGREE. HE HAS HAD HIS OFA COMPLETED FOR HIPS/ELBOWS WITH A GOOD/CLEAR GRADE. I AM IN THE PROCESS OF COMPLETING HIS DNA HEALTH TESTING AT THIS TIME. HE HAS A VERY DIVERSE PEDIGREE OF COLORS WITH CHAMPION BLOODLINES. HE STANDS AROUND 26 INCHES AT THE SHOULDERS, IS AROUND 70 LBS. DUE TO OVERWHELMING DEMAND FOR MY PUPPIES I REQUEST A $300.00 NON-REFUNDABLE EARNEST DEPOSIT THAT WILL BE APPLIED TO YOUR FINAL PURCHASE COST TO BE PLACED ON ANY WAITING LIST. 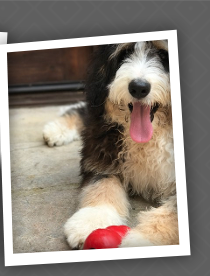 SO IF YOU ARE INTERESTED IN BEING PLACED ON THE WAITING LIST FOR ONE OF THESE AMAZING BERNEDOODLE PUPPIES PLEASE CONTACT ME BY E-MAIL AT PHANDMACHER@OUTLOOK.COM OR BY PHONE AT 865-221-4353. NEEDLESS TO SAY, I AM SO GLAD I DECIDED TO INCLUDE THE BMD INTO OUR BREEDING PROGRAM AS THEY ARE THE MOST BEAUTIFUL DOG I HAVE EVER LAID MY EYES ON. THEY ARE LARGE GENTLE, AFFECTIONATE, AND VERY INTELLIGENT. 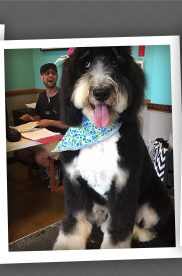 SO IF YOU ARE LOOKING FOR A BMD THAT IS LOW TO NON-SHEDDING THE BERNEDOODLE IS FOR YOU. BELOW I HAVE INCLUDED MORE INFORMATION ON THE BMD BREED REFERENCING THE BREEDS HISTORY, CHARACTERISTICS, COAT/GROOMING NEEDS, HEALTH AND LONGEVITY. THE BERNESE MOUNTAIN DOG (BMD) IS A BEAUTIFUL, LARGE, HARDY, POWERFUL DOG. IT IS BELIEVED TO HAVE ORIGINATED SOMETIME AROUND THE 18TH CENTURY. IT IS 1 OF 4 VARIETIES OF THE SWISS MOUNTAIN DOGS. THE BMD WAS USED PRIMARILY IN THE PAST AS DRAFTING DOGS, THEY PULLED CARTS TO THE MARKET, WERE USED IN FARMING FOR HERDING, GUARDING/WATCH DOGS AND AS COMPANIONS IN THE CANTON OF BERNE, SWITZERLAND. THE BERNESE MOUNTAIN DOG (BMD) IS CLASSIFIED IN THE AKC UNDER THE WORKING GROUP. TODAY THEY ARE USED AS COMPANIONS, HERDING DOGS, CARTING DOGS, IN TRACKING, SEARCH/RESCUE, WATCH DOGS, THERAPY DOGS AND DO WELL IN OBEDIENCE COMPETITIONS. THEY ARE VERY INTELLIGENT, EAGER TO PLEASE AND HAVE STEADY TEMPERAMENTS. THE BREED IS EASY GOING, EASY TO TRAIN, BUT REQUIRE A FIRM AND GENTLE TECHNIQUE AS THEY ARE SENSITIVE. THEY REQUIRE INCREASED PRAISE AND ATTENTION WITH TRAINING. THE MALES CAN BE STUBBORN AND DOMINANT TOWARD OTHER MALE CANINES. THEY ARE CALM, LOVE CHILDREN AND ARE EASILY SOCIALIZED WITH OTHER ANIMALS. IF LEFT ALONE AS A PUPPY OR FOR LONG PERIODS OF TIME THEY CAN BECOME TIMID AND HAVE SEPARATION ANXIETY. ALTHOUGH, THE BMD IS ATHLETIC AND AGILE, IT IS ALSO VERY CONTENT TO STAY INSIDE AND LIE AROUND THE HOUSE. THEY DO REQUIRE DAILY EXERCISE TO PROMOTE GOOD MENTAL AND PHYSICAL HEALTH, AS THEY ARE PRONE TO BECOME EASILY OVER WEIGHT. THE RECOMMENDED SIZE OF A BMD IS 24" TO 28" AT THE SHOULDER FOR MALES AND 23" TO 27" FOR FEMALES. WEIGHT OF MALES SHOULD RANGE BETWEEN 85 TO 110 LBS AND FEMALES FROM 80 TO 105 LBS. THE BERNESE MOUNTAIN DOG HAS THE MOST AMAZING COAT OF ANY DOG I HAVE ENCOUNTERED. IT IS AS BLACK AND SHINY AS TN COAL AND AS SMOOTH AS SILK. THE DOUBLE COAT IS THICK AND WAVY. THE WHITE AND RUST CONTRAST SETS OFF THE BLACK REMARKABLY! THIS COAT ALLOWS THE BERNESE MOUNTAIN DOG TO ENDURE AND THRIVE IN COLD, SNOWY WEATHER. THEY PREFER THE COLD OVER WARM WEATHER AND SHOULD BE KEPT OUT OF THE HEAT. IT IS RECOMMENDED THAT YOU TAKE YOUR DOG FOR WALKS IN THE EARLY MORNING OR LATE EVENING DURING WARMER MONTHS TO PREVENT HEAT EXHAUSTION. COAT COLORS RECOGNIZED BY THE AKC ARE AS FOLLOWS: BLACK, RUST AND WHITE; BLACK, TAN AND WHITE; BLACK AND RUST; BLACK AND WHITE; RUST AND WHITE. THEY REQUIRE VERY LITTLE GROOMING ABOUT EVERY 4 TO 8 WEEKS. BRUSHING AND COMBING IS RECOMMENDED DAILY TO ONCE A WEEK DEPENDING ON THE SEASON AND YOUR DOGS NEEDS TO REDUCE SHEDDING. THEY ARE HEAVY SEASONAL SHEDDERS AND WILL REQUIRE MORE GROOMING WITH SEASON CHANGES. THE EARS SHOULD BE CLEANED WEAKLY WITH A VET APPROVED EAR SOLUTION TO PREVENT EAR INFECTIONS. THE NAILS SHOULD BE CLIPPED DURING GROOMING AS NEEDED. THEIR TEETH SHOULD BE BRUSHED DAILY TO PREVENT DECAY AND GINGIVITIS. CANCER INCLUDES, HISTIOCYTIC SARCOMA, MASS CELL TUMORS, LYMPHOSARCOMA, OSTEOSARCOMA, HEMANGIOSARCOMA, FIBROSARCOMA. OTHER CONCERNS: PANOSTEITIS AND WOBBLER'S SYNDROME, GASTROINTESTINAL BLOAT, EPILEPSY, HEART DISEASE, CATARACTS, ENTROPIN/ECTROPIN, PROGRESSIVE RETINAL ATROPHY, HYPERTHYROIDISM, AUTO ITEMOLYTIC ANEMIA, LUPUS, DEGENERATIVE SPINAL MYELOPATHY, VON WILLEBRANDS.